Cabbage Tree Bay Aquatic Reserve in Sydney, Australia, is a haven for marine life and is a popular destination with snorkelers and divers alike. However, one marine photographer has captured what is thought to be two different motorcycles under the water in recent years. Pete McGee runs Goodviz Photography and recently posted a photo online of what looks to be an old twin shock trail bike standing in the water and covered in algae. 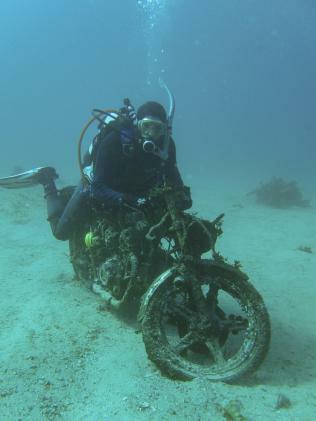 The wrecked bike is well known amongst local divers and snorkelers, however until this photo emerged it was thought there was only one in the bay. Mr McGee previously took a photo of his friend on a bike under the water 2011, which differs from the more recent snap. The remains of an engine are present in the older photo and the front wheel has considerably more spokes in the new picture.